Just the basics to get you started on entering the world of Telunor! We've got an introduction to D&D, an introduction to Telunor, and the first three episodes of the show. Enjoy! For those uninitiated in the mystical ways of Dungeons and Dragons, we welcome you to listen to this bonus episode. Scott the Dungeon Master will walk you through the bare bones minimum rules and highlight common terminology. Later, Stephanie joins us to help showcase these rules with a short Gunny-centric encounter. Skip this one if you're well-versed in D&D speak. New episodes released every other Tuesday. Partial transcript available at https://www.shockinggasp.com/home/bonus-intro-to-dd Website: www.shockinggasp.com Support us on Ko-fi: Ko-fi.com/shockinggasp Facebook: Shocking Gasp Twitter: @ShockingGaspDnD Reddit: r/ShockingGaspDnD Credits "Celebration" by Alexander Nakarada (www.serpentsoundstudios.com) under CC BY 4.0 (http://creativecommons.org/licenses/by/4.0) Remixed as needed. Prior to the official launch of the show, we're releasing five mini-episodes that allow you the chance to meet the cast and characters. This is part five of the series, and introduces you to Dungeon Master Scott and his creation, the World of Telunor. New episodes released every other Tuesday. Website: www.shockinggasp.com Support us on Ko-fi: Ko-fi.com/shockinggasp Facebook: Shocking Gasp Twitter: @ShockingGaspDnD Reddit: r/ShockingGaspDnD Credits "Celebration" by Alexander Nakarada (www.serpentsoundstudios.com) under CC BY 4.0 (http://creativecommons.org/licenses/by/4.0) Remixed as needed. 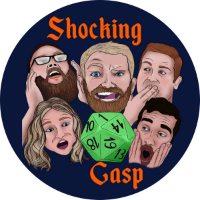 In the debut episode of Shocking Gasp, we meet four adventurers in the small Aldurian town of Nidri. Tychus goes shopping, Tilly helps an old man, Gunny looks for coffee, and Amos makes an unwanted friend. Just another day out and about. That is, until the four come face-to-face with destiny. And their lives will never be the same. New episodes released every other Tuesday. Full transcript available at https://www.shockinggasp.com/home/c1e1-livin-on-a-prayer Website: www.shockinggasp.com Support us on Ko-fi: Ko-fi.com/shockinggasp Facebook: Shocking Gasp Twitter: @ShockingGaspDnD Reddit: r/ShockingGaspDnD Credits "Celebration" by Alexander Nakarada (www.serpentsoundstudios.com) under CC BY 4.0 (http://creativecommons.org/licenses/by/4.0) Remixed as needed. “Cassiopeia” by Damiano Baldoni (http://freemusicarchive.org/music/Damiano_Baldoni) under CC BY 4.0 (http://creativecommons.org/licenses/by/4.0) Edited for time. In the second episode, Tychus loses his accent, Gunny sees a puppy, and the gang tries to figure out what the hell just happened. New episodes released every other Tuesday. Full transcript available at https://www.shockinggasp.com/home/c1e2-lose-yourself Website: www.shockinggasp.com Support us on Ko-fi: Ko-fi.com/shockinggasp Facebook: Shocking Gasp Twitter: @ShockingGaspDnD Reddit: r/ShockingGaspDnD Credits "Celebration" by Alexander Nakarada (www.serpentsoundstudios.com) under CC BY 4.0 (http://creativecommons.org/licenses/by/4.0) Remixed as needed. "Tracks" by Daniel Birch (https://www.danielbirchmusic.com) under CC BY-NC 4.0 (https://creativecommons.org/licenses/by-nc/4.0) Remixed as needed. With no supplies, no where to go, and no idea what's going on, the gang decides it's time for Tychus to get his accent back and for Amos to try out one of his own. Oh, and they should probably figure out where they're going next. New episodes released every other Tuesday. Full transcript available at https://www.shockinggasp.com/home/c1e3-ive-got-a-lovely-bunch-of-coconuts Website: www.shockinggasp.com Support us on Ko-fi: Ko-fi.com/shockinggasp Facebook: Shocking Gasp Twitter: @ShockingGaspDnD Reddit: r/ShockingGaspDnD Credits "Celebration" by Alexander Nakarada (www.serpentsoundstudios.com) under CC BY 4.0 (http://creativecommons.org/licenses/by/4.0) Remixed as needed. "Tracks" by Daniel Birch (https://www.danielbirchmusic.com) under CC BY-NC 4.0 (https://creativecommons.org/licenses/by-nc/4.0) Remixed as needed.